The above copper half penny measures 20.1 mm and weighs 1.86 grams. It was issued in the name of Anthony Poole, an ironmonger, who by the emblem on his token, appears to have traded under the sign of the Nag’s Head in Foster Lane. Foster Lane ran north off Cheap Side through the Aldersgate Ward of the city and into Farringdon Ward Within. This lane was traditionally the home of the goldsmith trade in London. Obverse: (rosette) ANTHONY. POOLE. IRONMONGR around inner circle; a nag’s head within. Behind the Nag’s head the bridle appears to be held in a gloved hand. Reverse: (mullet) IN.FOSTER.LANE.1668 (four pellets arranged in a diamond pattern) around inner circle; HIS / HALFE / PENY in four parallel lines within central field. It is likely that Anthony Poole traded from a plot and under a trade sign that had previously been used by Samuel Dawson prior to the destruction of Foster Lane by the Great Fire of London. Samuel Dawson issued his own half penny trade tokens under the sign of the Nag’s Head in Foster Lane in 1666. Anthony Poole was born in 1643 and died in 1679. He was buried in the churchyard or possibly the ruins of St Leonard’s in Foster Lane. 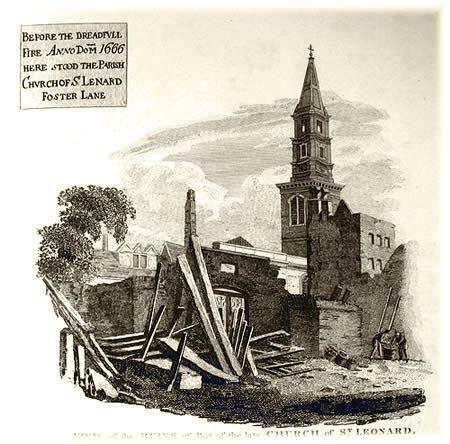 St. Leonard’s Church was destroyed in the Great Fire and never re-built. Its ruins were later used as an extension of the churchyard for burials. I have been unable to find any further contemporary references to Anthony Poole other than in a printed transcription of the records of Worshipful Company of Clockmakers of the City of London (1) to which guild Anthony Poole was presumably a member. In an entry for 21st February 1671/2 we find Anthony being reprimanded for having “faulty goods”, in the form of folding brass tipped wooden rules, for sale in his shop in Foster Lane. …Of Mr. Anthony Poole, Ironmonger in Foster Lane, seized two plaine joynted two foot Rules and five plaine two foot Rules foure of them being tipped with Brasse and one untipped. 1) Atkins, S.E. & Overall, W.H. Some Account of the Worshipful Company of clockmakers of the City of London (London. 1881).